Solander artist John Pusateri solo exhibition of portraits opened at Corbans Estate Art Centre, Henderson, Auckland on 22 July and will run until 4 September 2016. For those interested in Art History there will be also be a special talk on New Zealand portraiture with guest lecturer Associate Professor Leonard Bell from the University of Auckland, on Saturday 27 August. 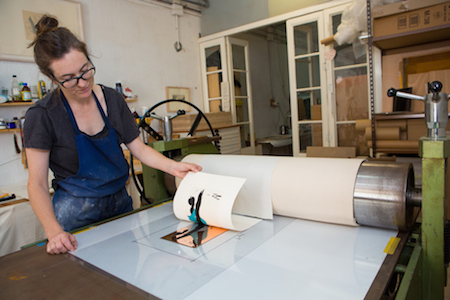 Click here to read an interesting APC interview with Solander artist Danielle Creenaune on her process and inspiration featured on the Australian Print Council blog. 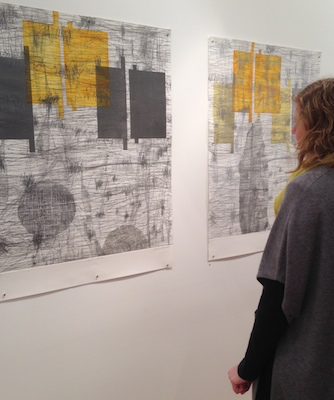 Drop in to the gallery to see her beautiful etching, mokulito and lithographic works. During November the five artists selected for the 47° South artist residency journeyed to Stewart Island to begin their research. On arrival the artists were treated to a warm welcome by the Stewart Islanders at a potluck community dinner hosted by the Rakiura Heritage Centre Trust. What followed was a series of experiences provided for the artists by tour operators on Stewart Island that were both astonishing in their beauty and insightful in their presentation. Jo from the Stewart Island Promotion Association and Toi Rakiura for their welcome and hospitality at the Community Centre dinner and enthusiastic support for the project. Stewart Island Experience for the thrilling ferry crossings and interesting tour of the Oban village and area; a perfect introduction to the island. Margaret from the Rakiura Museum Trust for a guided tour of the Museum and a fascinating window into the history of Stewart Island. Ulva our guide from Ulva’s Guided Walks, Ulva Island Bird Sanctuary enthralled the artists with wondeful interpretation of this precious bird sanctuary. Ty our Captain aboard Aurora Charters treated us to a tour of Big Glory Bay aquaculture, pelagic birdwatching and fishing for delicious blue cod. Seas were rough but the Aurora was a safe and stable vessel for our adventure. Furhana our passionate guide from Ruggedy Range™ Wilderness Experience provided a magical tour of Paterson Inlet, viewing of marine birdlife and a walk to the abandoned Norwegian Whaling Station. The weather was perfect to experience this historic and tranquil location. Thanks to Lee and Allan from Deep Bay Apartments for their in-home hospitality. Graham from Akomoana Lodge for the generous use of his comfortable guest house during our stay and his informed company. A special thank you to the children of the Stewart Island Halfmoon Bay School who enjoyed a wonderful morning of printmaking with some of the residency artists. The challenge is now for the artists to work through their experiences in their studios to create a suite of artworks for exhibition in May 2016 that encapsulates their interpretation of Stewart Island – Stay Tuned. Solander Gallery has initiated an artists residency project taking five Solander artists to Stewart Island during November 2015 and culminates in an exhibition of paintings and limited edition print works at Solander Gallery and on Stewart Island opening in May 2016. From this exhibition works will be selected for a travelling exhibition to tour Regional Galleries and Museums in late 2016 and 2017. The Artists involved in this project include Auckland artists Jacqueline Aust and John Pusateri, Wellington artist Jacqui Colley and Dunedin artists Jenna Packer and Inge Doesburg. Each artist has a desire to look beyond the immediate representation of landscape and to explore in a more abstracted way, their own personal and emotional response to Stewart Island and its place in New Zealand’s identity. Stewart Island is a unique and often overlooked part of New Zealand that has had a remarkable history, from Maori settlement, sealing in the early 1800’s, whaling right up to the 1960’s and currently the focus on environmental issues and tourism. Each of these historical phases has left behind its permanent physical, emotional and cultural mark on the Island. The Island’s isolation has contributed to the retention of many native species under threat in other places in New Zealand. What better place for artists to explore, be inspired, create and imagine. Solander Gallery would like to acknowledge the generosity and support for 47° South from our project partner, Stewart Island Promotion Association along with the support of Toi Rakiura, the Raikura Heritage Centre, the Stewart Island Community and the Stewart Island businesses. The Mildura BMW Australian Print Triennial is a major international art event spearheaded by The Art Vault, Mildura that brings together artists, academics, arts ambassadors and practising printmakers from Australia and overseas to engage in a celebration of art printmaking and its significance in modern Australia’s Art’s culture. A feature of the event is the inaugural Australian Print Triennial Prize, worth over $10,000. Congratulations to Solander Artists, Jacqueline Aust, Damon Kowarsky and Rona Green on being selected as finalists in this prestigious exhibition. The winner will be announced Friday 30 October at Art Vault, Mildura. To view a range of works currently available from the either of these artists go to their profile pages through the ‘Artists’ link. Jacqueline Aust is currently at the Art Vault in Mildura, Australia for a three week artist residency. The Art Vault is a magnificent facility! privately owned and operated by Julie and Kevin it’s has a magnificent Australian Print collection, a lovely gallery, 6-7 studio spaces (2-3 specifically for visiting artists), two beautiful apartments and facilities for all sorts of printmaking … Including a stone lithography workshop. 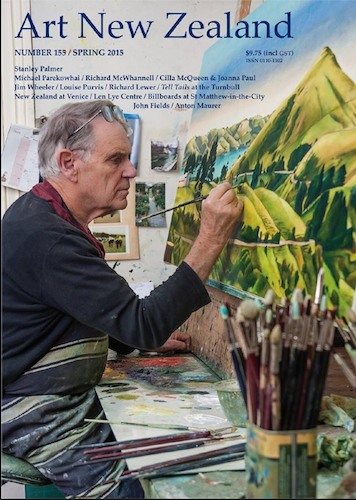 Stanley Palmer features on the latest cover of Art New Zealand. 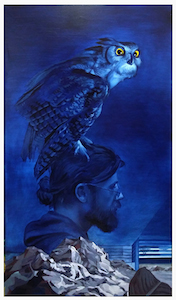 Richard Wolfe has written an extensive 9 page interview with Stanley who talks about his recent work and reflects on the development of his painting and printmaking practise spanning over 40 years. Click here to see our full range of Stanley Palmer’s paintings and prints. MIlarky has been based in Oakland, California. 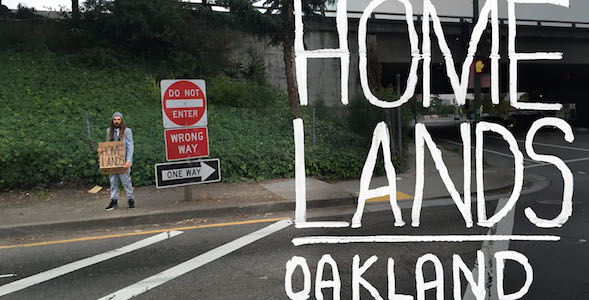 This collection, HOME LANDS | OAKLAND, has been sent back to New Zealand from his travels in the West Coast of America. The Collection was grown out of time spent in the area’s not advised to go, through observation and interaction. While there Milarky based his life style out of a small garage where he kept his paint and parked his truck in which he slept in. After a month based in this studio/garage he left it and has been since and still is surviving out of his vehicle. This collection was researched and created while he was living in his truck. gathering the sign’s from location’s he learnt as strategically good for street askers all over Oakland. This collection was inspired by the Homeless of Oakland, and the material’s are a collaboration between conversation’s and trading of what was trade able. MIlarky added his member’s, which are derived from the sign’s previous owner’s, while he was in a non disrespectful way, homeless himself. Solander artist Alexis Neal has been working on a significant body of work over the last two years inspired by her Sarjeant Gallery, Tylee Cottage residency. We hope you can get along to suppoprt Alexis for the opening. 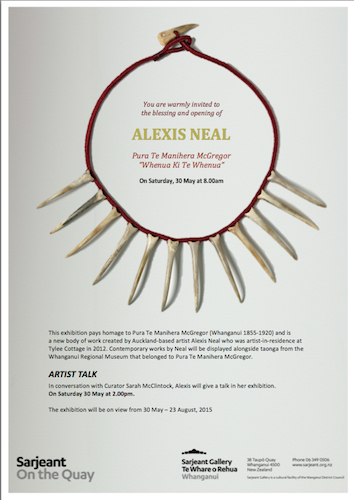 These new work by Alexis Neal are inspired by the story of prominent local woman Pura Te Manihera McGregor, (Maori Chieftainess, born Whanganui 1855 – 1920) whose remarkable taonga (treasures/artifacts) are housed at the Whanganui Regional Museum. The exhibition showcases new works alongside Taonga and engages with an important chapter of local history. This will include printmaking, whāriki (woven panels) and other mixed media works.